Web Based Email - FutureQuest, Inc. Using QuestMail, with your FutureQuest POP email accounts, you can compose, send, and receive email directly from the web! 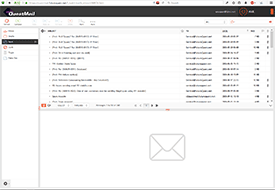 QuestMail is a web-based email client that enables every FutureQuest Email account holder to access email accounts from anywhere they have an Internet connection with a cookie-enabled web browser! QuestMail offers many advanced features including a practical address book, strong MIME support and flexible folder manipulation. Through the Options settings, you can control the way that QuestMail displays information by changing the theme/color selection, language preference, and other special display options. With a few clicks of the mouse, you can sort and highlight messages, automatically add a signature to all of your outgoing messages, or set up multiple identities. You also have the power to create and organize your folders in a way that works best for you. If you need help locating that special email, don't fret...QuestMail is even searchable! Note: QuestMail is based on the Roundcube project and as such the basic functionality is controlled by a development team outside of FutureQuest's Network. FutureQuest recommends using your own email client for primary email usage and QuestMail for those times when your email client is not readily available to you, such as when you are traveling or unable to access your personal terminal for whatever reason. QuestMail is made available as an added service and is not meant to be used as your primary email client. most available cookie-enabled web browsers with an Internet connection!